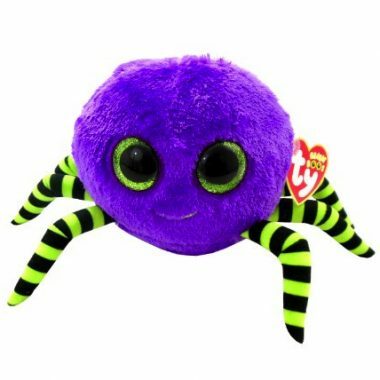 Crawly’s round body is made from a fuzzy purple material and he has eight green and black stripy legs. He has large sparkly green and black button eyes and a green stitched mouth. Cross me only if you dare! Crawly was introduced on 1st July 2014. His birthday is on 21st September. Black and purple versions of Crawly were released at the same time. The black version has fuzzy black fur and orange eyes and legs.